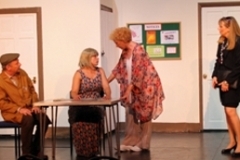 I am sure that those who bought a ticket to see ‘Agatha Crusty and The Village Hall Murders’ were expecting to see a comedy. A very funny play is certainly what they got but this should not overshadow the fact that this is also a genuine murder mystery with an ingenious plot that is eventually explained – in the finest traditions of Miss Marple – by Agatha Crusty (played by Christine Jones in top form). I have to confess that your correspondent was not even close to working o ut ‘whodunnit’. The Village Hall in ‘Chortleby’ looked remarkably like the one in Dorchester-on-Thames but there the similarities ended. Instead of a united team of dedicated, hard-working and public – spirited committee members, the village hall committee in Chortleby comprised a number of mostly self-centred individuals who pursued their own special interests with constant back biting and bickering. It must be said, however, that the events programme at Chortlebury Village Hall looked slightly more interesting – ‘Life-drawing’ classes, anyone? The play opens with just the hall caretaker on stage. Harry Knott (confidently played by Ian Brace) is a key member of the cast who had many of the best lines, delivered with a finesse that belies the fact that this was the first speaking part that Ian has had since…. well, when he was at school. He had some tricky business to cope with early on when the table at which he is sitting is supposed to collapse. To make something like that appear to be an accident when it has actually been done on purpose is no easy task but Ian accomplished it convincingly. I dare say that at this point some members of the audience started to worry about the stability of the set as a whole but this had been designed and robustly created by a team including Graham Beland, Ed Metcalfe, Simon Kitson and other DADS members. It looked great and was in no danger of collapse. The cast comprised 13 characters (which was certainly unlucky for some). The twins Olivia and Oliver Truscott-Pratt were very similar in both appearance and habits, even down to their unforgettable haughty, snorty ‘Hooray Henry’ laugh. I noticed, however, that they never appeared on stage at the same time. It was only when I consulted the programme that I realised that both parts were played by a very hard-working Rachel Winslet-Morris, who, as usual, excelled herself. 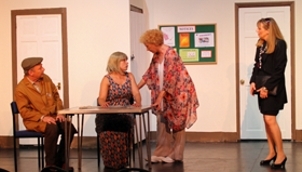 With two unexplained deaths in the first few minutes of the play (‘Bendy Wendy’ of the Pilates group and Barry Cragthorne, a leading light of the Gardening Society), it is not long before the local constable, PC Lockett (Michael Herbert), calls for reinforcements and the arrival of Detective Inspector Twigg (Mark Williams). D.I. Twigg, whose am- bition is to become a member of Special Branch (geddit? ), is soon in conversation with Village Hall Chair, Eleanor Wagstaff, and the Vicar, Rev. Toby Bishop (beautifully played respectively by Rosemary Mills and Mark Wilkin). These two have a successful working relationship; it is the Vicar who is actually in charge of the Hall and Eleanor who looks after the day to day running. In their private lives both are unattached and from Eleanor’s body language it is clear that she would like the relationship to become somewhat closer. Indeed, she obviously disapproves of some of the vicar’s female friends and becomes positively outraged at the thought of the Vicar participating in the Life Drawing class where DADS newcomer Natasha Cornell plays the part of Mandy the model. Twigg has a particular gift for misunderstanding what he has been told and generally getting the wrong end of the stick (geddit?). It’s the kind of role that Mark plays brilliantly – remember Inspector Pratt? Twigg sets out his approach to detective work using a series of acronyms: MOM + DAD = KIDS which can be translated as Motive Opportunity Means + Detection Application Dedication = Killers In Dock Sooner. It turns out that Twigg and Agatha Crusty have met before and neither holds the other in high regard. Thanks entirely to Agatha, the mystery is eventually solved and explained to the surviving members of the excellent cast. I have no wish to give away any secrets but it was an ‘inside job’. The writer Derek Webb worked in advertising for many years before becoming a freelance writer and director in 1996. His plays have been performed in the United States and Australia as well as throughout the U.K. The DADS performance was cleverly directed by Sue Kitson and produced by Louise Beland with light and sound suppled by Simon Ratliff and stage management from Jane Brooks. The production calls for no less than eleven scenes but these changes were managed efficiently and smoothly while the audience was entertained by the music from a wide range of popular crime shows. It would have made a good quiz. 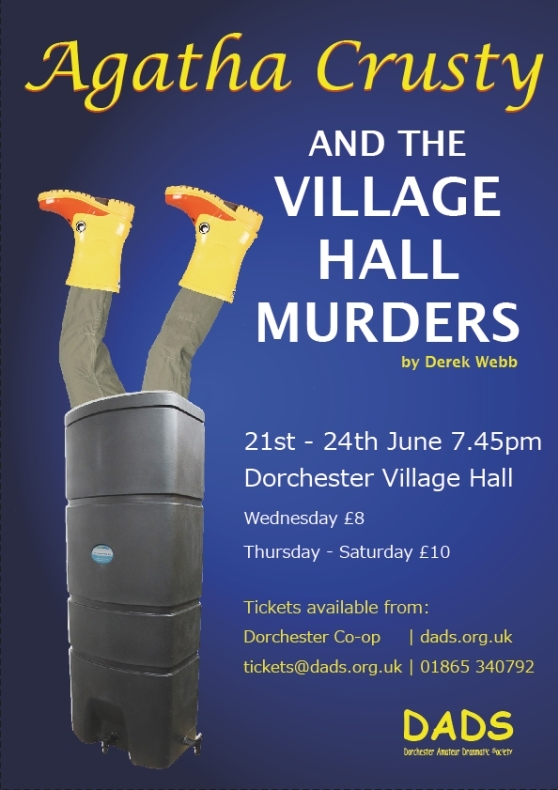 Thank you, Dorchester Amateur Dramatics Society for a thor- oughly entertaining evening and for providing cushions for our village hall chairs – something not available in Chortlebury. DADS welcomes experienced people and those who want to have a go at different roles both on stage and back stage. If anyone is interested in giving something a try please do contact us.